Giada says, "Piadini is a lot like a pizza, except that the crust doesn't rise and it's typically cooked on a grill to give it a nice, smoky flavor and crunchy crust. You can top a piadina with anything you like. This sauceless combination is very typical of northern Italy, where piadini are especially popular." Combine the flour, baking soda, and 1 teaspoon of salt in the bowl of an upright mixer fitted with a dough hook attachment. Add the butter and mix on low speed until incorporated, about 2 minutes. With the machine running, slowly add 10 to 12 tablespoons water until the mixture forms a dough around the hook. Transfer the dough to a lightly floured work surface and knead for 5 minutes until smooth. Cut the dough into 4 equal pieces. Form into disk shapes and wrap in plastic wrap. Refrigerate for 30 minutes. Place a grill pan over medium-high heat or preheat a gas or charcoal grill. On a lightly floured work surface, roll out each piece of dough into an 8 to 10-inch circle, about 1/8-inch thick. Brush each circle with the extra-virgin olive oil and grill for 4 minutes each side. 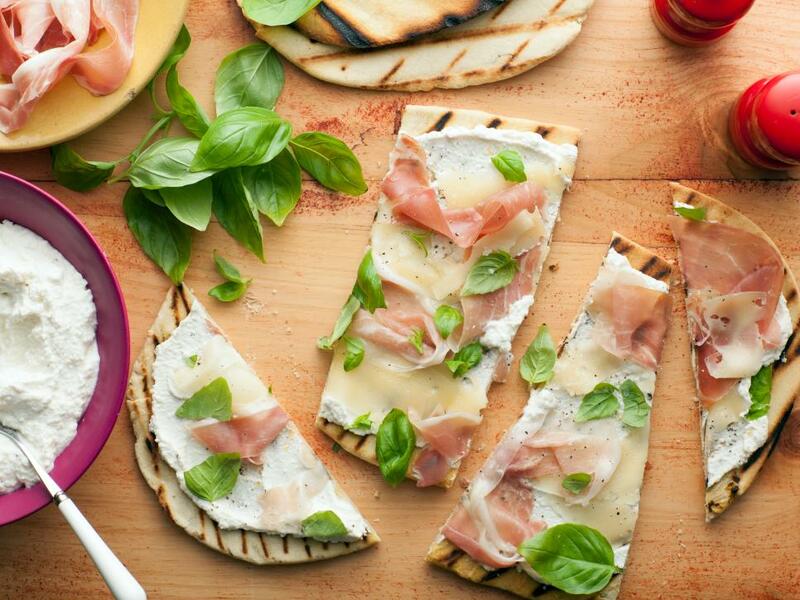 Remove the piadina from the grill to cool slightly. Combine the ricotta cheese and lemon zest in a small bowl. Season with salt and pepper. Spread each piadina with 1/2 cup of the ricotta mixture. Sprinkle the fontina cheese evenly over the ricotta cheese. Arrange 2 prosciutto slices on top of the cheeses. Cut each piadina into 8 wedges and transfer to a serving platter. Garnish with the chopped basil.